Nolan James Arenado (/ɛərəˈnɑːdoʊ/; born April 16, 1991) is an American professional baseball third baseman for the Colorado Rockies of Major League Baseball (MLB). He made his MLB debut with the Rockies in 2013. Arenado has been considered among the top third basemen in the league both for his contributions as a hitter for power and average, as well as his defensive range and arm strength. He is the only infielder to win the Rawlings Gold Glove Award in each of his first six MLB seasons. A native of Newport Beach, California, Arenado attended El Toro High School in nearby Lake Forest before becoming the Rockies' second-round selection in the 2009 MLB draft. Defensive accolades in addition to his six Gold Gloves include three consecutive of both the Fielding Bible and Wilson Defensive Player of the Year Awards for his position. A four-time selection to the MLB All-Star Game, he is a four-time Silver Slugger Award winner and has twice led the league in both home runs and runs batted in (RBI), and as of 2018 led all major leaguers in RBI since the start of the 2015 season. During his minor league career, Arenado was a two-time All-Star Futures Game selection, and led the minor leagues in RBI in 2011 with 155 over 163 total games. In 2016, Arenado became the youngest player in Rockies franchise history to reach 100 home runs. He played for the United States national team in the 2017 World Baseball Classic (WBC), winning Team USA's first gold medal in a WBC tournament. He hit for the cycle on June 18, 2017, and became the sixth player in history to finish off such a performance with a walk-off home run. In 2017, he became the 11th major leaguer and first third baseman in history to drive in 130 or more runs in three successive seasons. Arenado is of Cuban and Puerto Rican descent. Nolan James Arenado was born in Newport Beach, California, and raised in nearby Lake Forest, an Orange County city sandwiched between Irvine, Mission Viejo and Laguna Hills. His father, Fernando, is of Cuban nationality, and his mother, Millie, a native of Queens, New York, is of Cuban and Puerto Rican ancestry. His younger brother, Jonah, is a corner infielder in the San Francisco Giants' organization. A first cousin, Josh Fuentes, is an infielder who plays in the Rockies' organization. Arenado grew up a Los Angeles Dodgers fan. He attended El Toro High School in Lake Forest, and played shortstop on the school's baseball team with fellow future major leaguers Austin Romine and Matt Chapman. In 2008, Arenado's junior year, El Toro won the California Interscholastic Federation Southern Section championship. He was named to the Los Angeles Times' All-Star team after leading his division with a .456 batting average, 32 runs batted in (RBI), and 33 runs scored. As a senior, Arenado batted .517, .615 on-base percentage (OBP), five home runs (HR), 14 doubles, and a triple, and was again named to the Los Angeles Times' All-Star team. He committed to attend Arizona State University (ASU) on a college baseball scholarship. The Colorado Rockies selected Arenado in the second round with the 59th overall selection of the 2009 Major League Baseball (MLB) draft. Rather than attend ASU, he signed with the Rockies, and made his professional baseball debut with the Casper Ghosts of the Rookie-level Pioneer League, where he batted .300. In 2010, Arenado played for the Asheville Tourists of the Class A South Atlantic League, where he posted a .308 batting average and 41 doubles. Prior to the 2011 season, Baseball America ranked Arenado as the Rockies' third-best prospect and 80th overall. Although already highly acclaimed as a hitter, his defense at the time lagged behind his abilities in the batter's box. It was not until his chapter with the Modesto Nuts of the Class A-Advanced California League that he began focusing on and improving his defensive approach. He had actually manifested exceptional arm strength and soft hands; however, any potential dominance in that facet of the sport was neutralized with clearly inept footwork. Arenado later recalled that he “had really bad feet,” and “was too lazy,” for which Modesto manager Jerry Weinstein relentlessly scolded him. He tasked Arenado to take ground balls earlier than the other players and to move rapidly and precisely and maintain readiness at third base. In addition, Arenado began lifting weights in earnest while pushing himself to improve. The augmentations in training and skill later consummated in a combination of explosive vigor, ingenuity, and finesse in which he deftly launched after ground balls, fluidly covered vast surface area, and generated breathtaking throws of long and short distances from the extent of statures of fully erect to almost totally laying down, to constantly deliver the unexpected out of the runner in nearly every position of the basepath. Along with Wilin Rosario, Arenado represented the Rockies at the 2011 All-Star Futures Game. His first-half totals included a .283 batting average with six home runs and 42 RBI. He finished the season with a .298 batting average and 20 home runs, leading the minor leagues with 122 RBI. Later in the year, he was named the Most Valuable Player (MVP) of the Arizona Fall League (AFL) after hitting .388 with six home runs and 33 RBI. In 163 games combined in the California League and AFL in 2011, Arenado batted .315 with 201 base hits, 155 RBI, 26 home runs and 44 doubles. Playing for the Tulsa Drillers of the Class AA Texas League in 2012, he was again named to appear in the All-Star Futures Game. He finished the year with a .285 batting average, 12 home runs, and 56 RBI. Despite a strong spring training showing in 2013, the Rockies optioned Arenado to the Colorado Springs Sky Sox of the Class AAA Pacific Coast League (PCL) to start the season. Through April 28, he batted .364, 1.059 on-base plus slugging percentage (OPS), three home runs, and 21 RBI with Colorado Springs. At that point, Colorado promoted him to the major league club, and designated Chris Nelson for assignment to make room on the roster. Arenado went 0-for-3 in his major league debut against the Arizona Diamondbacks at Chase Field. He recorded his first three major league hits in his second game—including his first home run off of pitcher Josh Wall—in a 12–2 win versus the Los Angeles Dodgers. In his sixth game, he hit first major league grand slam and second career home run off Tampa Bay Rays pitcher David Price. Arenado's defensive dominance translated smoothly to the major leagues, as ESPN.com published on September 7 that he would have ranked second for a hypothetical National League (NL) Defensive MVP Award. He trailed only shortstop Andrelton Simmons for the league lead in Defensive Runs Saved (DRS), 38–30. He appeared in 133 major league games and slashed .267/.301/.405 with 10 home runs and 52 RBI. Defensively, he led NL third basemen in range factor both per game (3.08) and per nine innings (3.24), and was second in putouts (91), assists (309) and double plays turned (tied with two others with 27). On October 29, 2013, Arenado became the first NL rookie to win a Rawlings Gold Glove Award at third base, and the first in both major leagues since Frank Malzone won in the American League in 1957. Arenado tied for seventh place with Evan Gattis in the NL Rookie of the Year Award voting which was won by José Fernández with Arenado receiving the most votes as a third baseman. The first multi-home run game of Arenado's career occurred on April 5, 2014, against Brandon McCarthy of the Arizona Diamondbacks in a 9–4 Rockies win. On May 8, Arenado hit safely in his 28th consecutive game to break the Rockies' franchise hit streak record, which Michael Cuddyer set the previous season. On May 23, Arenado suffered a mallet fracture of his left middle finger on a headfirst slide into second base in a game against the Atlanta Braves, and was subsequently placed on the 15-day disabled list (DL). Arenado missed 37 games due to the fracture and returned on June 28. He earned his first career NL Player of the Week Award for the week ending August 24. He batted .545 with a 1.645 OPS and 12 hits, three doubles, one triple, two home runs, three RBI, and six runs scored. Due to a chest contusion and early onset pneumonia, Arenado missed additional time at the end of the season. On the year, he batted .287/.328/.500, hitting 18 HR and driving in 61 runs. He won his second Gold Glove Award despite playing in just 111 games. In 2015, Arenado earned his second NL Player of the Week Award on June 28, hitting a major league-leading three multi-home runs games in six games, seven home runs and 14 RBI. He also scored 10 times, second-highest in the major leagues. He became an MLB All-Star for the first time as a National League reserve at Great American Ball Park in Cincinnati. At the time his selection was announced, he was fifth in the majors in home runs with 24 and led in RBI with 68. He had hit more home runs in road games than at Coors Field (15 to nine), more RBI (37 to 31) and posted higher on-base (.318 to .309) and slugging (.615 to .580) percentages. Playing against the San Francisco Giants on September 5, Arenado homered in his sixth consecutive game, breaking the Rockies' team record of five which Dante Bichette and Larry Walker shared. He won his first NL Player of the Month award in September, batting .339 and leading the major leagues with 11 HR, 32 RBI, and 79 total bases. He collected an NL-leading 38 hits and was second in the league with .705 SLG. For the 2015 season, Arenado tied Bryce Harper for the NL home run title with 42, and led the National League with 130 RBI and 354 total bases. In addition, he batted .287 with a .323 OBP, .575 SLG, .898 OPS, 43 doubles, and 11 sacrifice flies (leading the majors) on his way to winning his first Silver Slugger Award for third basemen. He was the first Rockies player to lead the NL in home runs since Walker hit 49 in 1997 and the first to lead the majors in RBI since Andrés Galarraga with 150 in 1996. Additionally, Arenado set a major league record for extra base hits by a third baseman in one season with 89, surpassing Chipper Jones' total of 87 in 1999. On defense, Arenado won his third consecutive Gold Glove, and, for the first time, was the major league-wide winner among third basemen for both the Fielding Bible and the Wilson Defensive Player of the Year Awards. He became the second Rockies player to win the Fielding Bible at any position, following shortstop Troy Tulowitzki. The Colorado Sports Hall of Fame named Arenado the winner of their Professional Athlete of the Year Award for 2015. He received official consideration for the NL MVP Award for the first time, ranking eighth in voting behind Harper, Paul Goldschmidt, Joey Votto, Anthony Rizzo, Andrew McCutchen, Jake Arrieta, and Zack Greinke. Arenado and the Rockies avoided salary arbitration on January 15, 2016, agreeing to a one-year, $5 million contract, a raise from $512,000 in 2015. He was named NL co-Player of the Week with Harper for April 18 after leading the NL with four home runs and 12 RBI. He also carried an .852 SLG, led the NL with 23 total bases, and tied for second with seven runs scored. Arenado made his second All-Star Game, played at Petco Park in San Diego. He hit his 100th career home run on August 8, making him the youngest player in franchise history to do so, at just under age 25 years and four months. In September Arenado became the second player aged 25 and younger within the previous 75 seasons to drive in 125 runs in successive seasons. Overall, in 160 games, Arenado finished the year tied with Chris Carter for the National League at a batting average of .294, 182 hits, 35 doubles, 116 runs scored, an MLB-leading 133 RBI, 82 extra base hits, 68 walks (double the number from 2015), a .362 OBP, a .570 SLG and a .932 OPS. Arenado won his fourth consecutive Gold Glove at the third base position, becoming the first third baseman in MLB history to win four Gold Gloves in his first four seasons, as well as his second Silver Slugger, Fielding Bible and Wilson Defensive Player of the Year Awards. He also became the first player in Rockies history to lead the Majors in RBIs in two separate seasons. Arenado finished in fifth place in the NL MVP Award voting behind Kris Bryant, Daniel Murphy, Corey Seager and Rizzo, receiving almost double the number of vote points as he had gotten the year before (199 points in 2016 versus 102 in 2015). Prior to the start of spring training, on January 13, 2017, Arenado and the Rockies avoided arbitration for the second year in a row by agreeing to a two-year $29.5 million contract. He received $11,750,000 for 2017 followed by $17,750,000 during the 2018 season. On June 18, he hit for the cycle versus the San Francisco Giants. The home run was a walk off versus closer Mark Melancon, finishing off a 7−5 Rockies win. It was just the sixth time[a] in MLB history that a cycle featured a walk-off home run; Arenado's teammate Carlos González was the previous to do so, on July 31, 2010. The 288th cycle in MLB history, Arenado's was the eighth by a Rockies player, and the 17th overall accomplished at Coors Field. During the June 28 game versus the Giants, he knocked down a line drive batted by pitcher Ty Blach as he was facing third base, spun on his stomach, and, without getting up on his feet, threw out Blach at first base. For the first time in his career, Arenado was selected to start in the MLB All-Star Game, played at Marlins Park in Miami, after receiving the most fan votes of all National League third baseman. His third overall selection, Arenado batted sixth and collected two singles in two at bats. Arenado set career-highs with three home runs and five hits, while tying a career-high seven RBI in an 18–4 rout of the San Diego Padres on July 19. He tied the franchise record held by Jeff Cirillo and Todd Walker for the number of total bases in a single game with 14, and became the first player in Rockies history to reach both three home runs and five hits in a single game. He also became the first player in the majors to reach 80 RBI. Named Player of the Week for the fourth time of his career on July 23, Arenado hit .458/.480/1.000 with four home runs and 13 RBI in five games. He later won the Player of the Month Award for July, his second monthly award, after hitting .389/.423/.744 with eight home runs, 35 hits, 15 extra base hits, 30 RBIs and 18 runs scored in 22 games. With a two-run home run versus José Ureña of the Miami Marlins on August 11, Arenado became the first major leaguer of 2017 to reach 100 RBI for the third year in a row, doing so in 112 games. He had batted .441 and 77 RBI with runners in scoring position (RISP) in those 112 games. He was ejected by umpire Pat Hoberg from the August 12 game in the seventh inning versus Miami for throwing his bat. Arenado's batting turn was up in the ninth inning, before Miami prevailed, 4–3. A pitch from Vance Worley on August 14 hit him on the left hand. An X-ray revealed no fractures, and he was ruled to miss the DL, but swelling resulted. On September 16 versus the Padres, Arenado drove in his 125th run of the season, becoming the first third baseman and first Rockies player to do so in three consecutive seasons. Later that September, he became the 11th player and 1st third baseman in major league history to drive in 130 or more runs in three consecutive seasons. Writing for The Sporting News, Joe Rivera noted, that per Fangraphs, Arenado was the fourth player in history to net at least 100 defensive runs saved within his first five seasons (103). Through September 28, he had batted .365 and 1.297 OPS in situations of two outs and runners in scoring position for the season. Making his first postseason appearance in the NL Wild Card Game, Arenado went 1-for-5 with a home run and two runs scored as the Rockies lost to the Diamondbacks 11–8 at Chase Field, ending their season. Arenado finished the season with a .309 batting average, 187 hits, 43 doubles, seven triples, 37 home runs (tied for third most in the league with teammate Charlie Blackmon and Miami's Marcell Ozuna), and 130 RBI. The RBI total was second to Giancarlo Stanton for the major league lead by two, resulting in Arenado just missing leading the majors for a third consecutive season. He also scored 100 runs, produced 87 extra base hits, 355 total bases, 62 walks, nine intentional walks, three stolen bases, .373 OBP, .586 SLG and .959 OPS over 159 games. He established or tied career highs in batting average, hits, doubles, triples, total bases, stolen bases, OBP, SLG and OPS. End of campaign awards for Arenado included a selection as the third baseman of Baseball America's All-MLB Team and third successive Silver Slugger Award. He was the Players Choice for the Majestic Athletic Always Game Award, identifying "the player who constantly exhibits grit, tenacity, perseverance and hustle on and off the field, all for the benefit of his teammates and fans." An amplitude of defensive accolades eventualized including a fifth straight Gold Glove Award, making him the first infielder to arrogate this in each of his first five seasons in the major leagues. Only Ichiro Suzuki, as a right fielder, won more Gold Gloves to start his career (10). 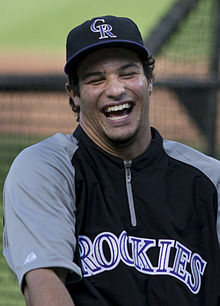 Arenado won his first Platinum Glove Award as the finest defensive member of all the National League, and a third succedent promotion of both the Fielding Bible and Wilson Defensive Player of the Year Awards for third base. He clinched fourth place in the NL MVP voting—the highest ranking of his career—behind Stanton, Votto and Goldschmidt, and ahead of fifth-place Blackmon. Prior to the 2018 season, Sports Illustrated ranked Arenado as the eighth top overall player, and the "best defensive infielder in baseball. Third base is the deepest position in baseball today, but none can quite do what Arenado can." The Rockies and he agreed to defer contract extension negotiations until after the season. On April 11, San Diego Padres pitcher Luis Perdomo threw a pitch behind Arenado, who charged the mound and incited a bench-clearing brawl. Two days later, the league suspended both players for five games. In his first game back, Arenado hit his 150th career home run versus Kyle Hendricks in a 16−5 loss to the Chicago Cubs. After homering and collecting at least two hits in each of four consecutive games, Arenado was named NL Player of the Week on June 25. His aggregate included .379/.419/.955 with five home runs, two doubles, seven runs scored, and 13 RBI. After producing a first half batting .305, 22 home runs and 63 RBI, Arenado was voted to start the 2018 MLB All-Star Game for the second year in a row, and fourth selection overall. He finished his 2018 campaign slashing .297/.374/.561 with 38 home runs and 110 RBIs in 156 games. After the season, he won his sixth consecutive Gold Glove. He also won his second consecutive Rawlings Platinum Glove Award  with his former high school teammate Matt Chapman. On February 26, 2019, Arenado agreed to a eight year $260 million dollar contract extension with the Colorado Rockies. Arenado played for United States national baseball team in the 2017 World Baseball Classic (WBC). On March 22, 2017, Team USA won 8–0 over the previously undefeated Puerto Rico, marking the first time ever that the United States won the WBC. As Arenado's' reputation as a defender has grown, he has shown to be exceptionally skilled in range, catching the ball, and throwing, including arm strength and accuracy, and maintaining that while throwing off-balance. Remarked Denver Post beat writer Patrick Saunders, "In every city I travel, writers, broadcasters and fans rave about Arenado’s magic at the hot corner." As a hitter, Arenado has been recognized for developing into one of the top sluggers in the game by posting numbers among the best in the Majors in many categories, including hits, batting average, slugging percentage, home runs, RBIs and extra base hits. Formerly, Arenado's agent was Scott Boras. As of November 2015, it was reported as Joel Wolfe of Wasserman Media Group. Arenado's favorite players are fellow third basemen Adrián Beltré of the Texas Rangers and Rockies teammate and outfielder Matt Holliday. Arenado apprised that he attempts to mimic Holliday's swing, "because he stayed through the ball so much." His former El Toro High School teammate is fellow MLB Third Baseman, Matt Chapman. Longtime Dodgers play-by-play announcer Vin Scully autographed the bat with which Arenado hit his 40th home run of 2016, during Scully's last season of broadcasting, and his final series of calling Dodgers' home games. ^ According to Elias Sports Bureau, it was only the fifth time in MLB history. ^ Russo, Billy (May 15, 2013). "Siente y padece como latino)". ESPN Deportes (in Spanish). Retrieved February 27, 2016. ^ Ballew, Bill (June 4, 2015). "Arenado finds his own road: Augusta third baseman motivated by success of big league brother". MiLB.com. Retrieved June 4, 2015. ^ Gallegos, Martín (April 5, 2017). "Giants prospect chasing big-league brother". The Mercury News. Retrieved April 21, 2018. ^ Saunders, Patrick (March 18, 2018). "Arenado brothers — Rockies' Nolan, Giants' Jonah — square off for first time". The Denver Post. Retrieved April 21, 2018. ^ Tate, Van (April 5, 2018). "Isotopes Infielder Josh Fuentes has a Colorado Rockies family tie". KRQE. Retrieved April 21, 2018. ^ a b Sondheimer, Eric (April 17, 2009). "Mater Dei shortstops are long on talent". Los Angeles Times. Retrieved April 29, 2013. ^ Berg, Ted (April 22, 2013). "Six guys set to become MLB stars". USA Today. Retrieved April 29, 2013. ^ Fryer, Steve (May 29, 2008). "Young El Toro doesn't wait, grabs Division II title". OC Varsity. Archived from the original on May 23, 2014. Retrieved April 29, 2013. ^ Arritt, Dan (June 11, 2008). "The Times' high school all-star teams". Los Angeles Times. Retrieved February 9, 2015. ^ a b c d Pleskoff, Bernie (April 1, 2013). "Rockies' prospect Arenado has impact bat". MLB.com. Retrieved April 29, 2013. ^ Bolch, Ben (June 18, 2009). "The Times' All-Star team". Los Angeles Times. Retrieved May 1, 2013. ^ Colorado Rockies Press Release (July 7, 2009). "Rockies agree to terms with 2009 first-year player draft selections Brothers, Arenado, Paulsen". MLB.com. Retrieved April 29, 2013. ^ Ringolsby, Tracy (January 19, 2011). "Colorado Rockies Baseball America Top 10 prospects". Baseball America. Retrieved April 29, 2013. ^ Staff Report (February 23, 2011). "2011 Top 100 Prospects". Baseball America. Retrieved April 29, 2013. ^ a b c Passan, Jeff (August 24, 2017). "How Nolan Arenado went from good to great". Yahoo! Sports. Retrieved September 17, 2017. ^ a b Kosmider, Nick (June 23, 2011). "Rox land Rosario, Arenado in Futures Game". colorado.rockies.mlb.com. Retrieved April 29, 2013. ^ a b c d Harding, Thomas (June 21, 2012). "Arenado, Cabrera to play in All-Star Futures Game". MLB.com. Retrieved April 29, 2013. ^ a b Mayo, Jonathan (November 20, 2011). "Arenado named Arizona Fall League MVP". MLB.com. Retrieved April 29, 2013. ^ Whicker, Mark (November 22, 2011). "Arenado 'automatic' in Arizona Fall League". Orange County Register. Retrieved May 9, 2014. ^ "Nolan Arenado minor league statistics & history". Baseball-Reference.com. Retrieved September 27, 2015. ^ Renck, Troy (September 14, 2010). "Colorado Rockies balancing patience, urgency in Nolan Arenado case". The Denver Post. Retrieved April 29, 2013. ^ Harding, Thomas (April 28, 2013). "Prospect Arenado ready to face high expectations". colorado.rockies.mlb.com. Retrieved April 29, 2013. ^ Plunkett, Bill (April 30, 2013). "Rockies' Arenado (El Toro High) has a night of firsts". Orange County Register. Retrieved April 18, 2018. ^ Buettner, Matthew (May 6, 2013). "Rockies' Nolan Arenado already a fan favorite after 8 days in the majors". KCNC-TV. Retrieved April 18, 2018. ^ Simon, Mark (September 7, 2013). "NL Defensive MVP? Simmons/Arenado lead". ESPN.com. Retrieved April 18, 2018. ^ a b "2013 awards voting". Baseball-Reference.com. Retrieved April 15, 2018. ^ "2013 NL fielding leaders". Baseball-Reference.com. Retrieved April 18, 2018. ^ a b c Saunders, Patrick (October 29, 2013). "Rockies' Carlos Gonzalez, rookie Nolan Arenado win NL Gold Gloves". The Denver Post. Retrieved May 9, 2014. ^ "Arenado, Rockies Rally Past D-Backs 9–4". KCNC-TV CBS Denver. Associated Press. April 5, 2014. Retrieved February 1, 2016. ^ a b "Nolan Arenado sets Rockies record". ESPN.com. May 9, 2014. Retrieved May 9, 2014. ^ Morgan, Joe (May 24, 2014). "Arenado breaks finger on headfirst slide, hits DL". MLB.com. Retrieved May 31, 2014. ^ a b Schulman, Harry (August 25, 2014). "SF Giants update: Tim Lincecum to miss next start". San Francisco Chronicle. Retrieved February 10, 2016. ^ a b Groke, Nick (June 29, 2015). "Nolan Arenado named NL player of the week after hot streak, still trailing in all-star voting". The Denver Post. Retrieved February 9, 2016. ^ a b Bergstrom, Richard (July 11, 2015). "Fans should get to know new All-Star Nolan Arenado". ESPN.com. Retrieved February 9, 2016. ^ Groke, Nick (July 6, 2015). "Nolan Arenado, DJ LeMahieu named to NL all-star team; Troy Tulowitzki still pending". The Denver Post. Retrieved February 9, 2016. ^ a b Saunders, Patrick (September 5, 2015). "Nolan Arenado gets into Rockies' record book, but Giants win: Third Baseman sets franchise record with sixth consecutive home run game". The Denver Post. Retrieved February 9, 2016. ^ a b c d Saunders, Patrick (October 5, 2015). "Nolan Arenado, Rockies 3B, named September NL player of the month". The Denver Post. Retrieved February 9, 2016. ^ "MLB Statistics - 2015". ESPN. Retrieved February 9, 2016. ^ a b Groke, Nick (November 12, 2015). "Rockies Nolan Arenado, Carlos Gonzalez win Silver Slugger awards". The Denver Post. Retrieved February 9, 2016. ^ Miller, Doug (November 10, 2015). "Defensive standouts nab Gold Glove Awards". MLB.com. Retrieved November 10, 2015. ^ a b Saunders, Patrick (November 10, 2015). "Rockies' Nolan Arenado awarded third consecutive NL Gold Glove". The Denver Post. Retrieved February 9, 2016. ^ a b c Harding, Thomas (November 5, 2015). "Arenado wins Fielding Bible Award at third". MLB.com. Retrieved February 9, 2015. ^ a b Kubatko, Roch (November 11, 2015). "Machado denied Wilson Defensive Player of the Year Award". MASN.com. Retrieved February 9, 2016. ^ a b MHS Staff (January 13, 2016). "Nolan Arenado, Christian McCaffrey among Colorado Sports Hall of Fame 2015 honorees". Mile High Sports. Retrieved February 9, 2016. ^ "2015 awards voting". Baseball-Reference.com. Retrieved April 21, 2018. ^ "Rockies and third baseman Nolan Arenado reach $5M deal". Yahoo! Sports. Associated Press. January 15, 2016. Retrieved February 9, 2016. ^ a b Meech, Grant (April 18, 2016). "Nolan Arenado named NL Co-Player of the Week". KOAA.com. Retrieved April 24, 2016. ^ a b Groke, Nick (July 5, 2016). "2 Rockies make NL all-star team, third slugger is still in the running: Rookie shortstop Trevor Story makes final fan vote". The Denver Post. Retrieved August 13, 2016. ^ a b Kosmider, Nick (August 8, 2016). "Nolan Arenado reaches milestone with 100th home run: Arenado becomes youngest player in franchise history to reach mark". The Denver Post. Retrieved August 13, 2016. ^ Saunders, Patrick (September 27, 2016). "Nolan Arenado disappointed in Rockies' season, proud of his historic production". The Denver Post. Retrieved September 28, 2016. ^ "Rockies' Arenado agrees to $29.5 million, 2-year contract". FoxSports.com. Associated Press. January 13, 2017. Retrieved September 28, 2017. ^ "Nolan Arenado completes cycle with game-winning homer". ESPN.com. Associated Press. June 19, 2017. Retrieved June 19, 2017. ^ Snyder, Matt (June 18, 2017). "Rockies' Nolan Arenado hits walk-off home run to complete the cycle vs. Giants". CBSSports.com. Retrieved June 18, 2017. ^ Harding, Thomas (June 18, 2017). "Arenado completes cycle with walk-off homer". MLB.com. Retrieved June 18, 2017. ^ Joseph, Andrew (June 28, 2017). "Nolan Arenado made a ridiculous diving stop and throw all from the ground". USA Today For the Win. Retrieved August 12, 2017. ^ a b Saunders, Patrick (July 2, 2017). "Nolan Arenado leads quartet of Rockies heading to MLB All-Star Game". Denver Post. Retrieved July 19, 2017. ^ "2017 All-Star Game box score, July 11". Baseball-Reference.com. Retrieved July 19, 2017. ^ Cassavell, A. J.; Gelman, Max (July 19, 2017). "Nolan, Nolan, Nolan: 3 HRs power Rox rout". MLB.com. Retrieved July 19, 2017. ^ a b Trezza, Joe (July 24, 2017). "Monster week earns Arenado NL POW honors". MLB.com. Retrieved August 7, 2017. ^ a b Saunders, Patrick (August 2, 2017). "Nolan Arenado, MVP candidate, named NL player of month for July". The Denver Post. Retrieved August 7, 2017. ^ Pinak, Patrick (August 11, 2017). "Arenado reaches 100 RBIs on 2-run homer". MLB.com. Retrieved August 11, 2017. ^ Pinak, Patrick (August 12, 2017). "Arenado uses ejection as learning moment: 3rd baseman knows postseason-hopeful Rockies need him on field". colorado.rockies.mlb.com. Retrieved August 12, 2017. ^ Groke, Nick (August 14, 2017). "Nolan Arenado dodges the disabled list, to Rockies' relief, but he will miss time: An X-ray Sunday showed no broken bones and the swelling on the outside of his hand decreased overnight". The Denver Post. Retrieved August 15, 2017. ^ "Rockies rout Padres 16−0, gain ground in wild-card race". ESPN.com. Associated Press. September 16, 2017. Retrieved September 17, 2017. ^ Rivera, Joe (September 28, 2017). "It's time to stop sleeping on Nolan Arenado". The Sporting News. Retrieved September 28, 2017. ^ Schoenfield, David (October 4, 2017). "Paul Goldschmidt and Nolan Arenado finally get their night on the national stage". ESPN.co.uk. Retrieved November 23, 2017. ^ "2017 National League Wild Card (NLWC), Rockies at Diamondbacks". Baseball-Reference.com. October 4, 2017. Retrieved November 23, 2017. ^ a b USA Today Sports (November 9, 2017). "Jose Altuve, Nolan Arenado among repeat Silver Slugger Award winners". USA Today. Retrieved November 10, 2017. ^ a b MLB.com (November 8, 2017). "Altuve garners two Players Choice Awards". MLB.com. Retrieved November 8, 2017. ^ Saunders, Patrick (November 7, 2017). "Rockies' Nolan Arenado wins 5th Gold Glove; DJ LeMahieu snares his second". Denver Post. Retrieved November 8, 2017. ^ a b Randhawa, Manny (November 11, 2017). "Arenado goes platinum at GG Awards ceremony". MLB.com. Retrieved November 15, 2017. ^ a b Harding, Thomas (November 3, 2017). "Arenado could lay claim to numerous awards". MLB.com. Retrieved November 8, 2017. ^ USA Today Sports (November 10, 2017). "Byron Buxton named Major League Baseball's defensive player of the year". USA Today. Retrieved November 10, 2017. ^ Ortíz, Jorge L. (November 16, 2017). "Marlins' Giancarlo Stanton edges out Reds' Joey Votto for NL MVP in fourth closest election". USA Today. Retrieved November 23, 2017. ^ SI.com Staff (February 15, 2018). "SI's Top 100 MLB Players of 2018: The Top 10". Sports Illustrated. Retrieved February 17, 2018. ^ Varela, Ashley (March 4, 2018). "Nolan Arenado, Rockies unlikely to reach extension this spring". NBC Sports. Retrieved March 4, 2018. ^ Kramer, Daniel (April 11, 2018). "Tempers erupt as Arenado charges mound: Five players ejected in finale of series with back-and-forth HBPs". MLB.com. Retrieved April 11, 2018. ^ Lott, Thomas (April 14, 2018). "Nolan Arenado, Padres' Luis Perdomo each suspended 5 games for brawl". The Sporting News. Retrieved April 15, 2018. ^ Harding, Thomas (April 21, 2018). "Rockies' bats can't pick up Gray in loss to Cubs". Rockies.com. Retrieved April 26, 2018. ^ a b Saunders, Patrick (June 25, 2018). "Nolan Arenado named National League player of week". Journal-Advocate. Retrieved July 4, 2018. ^ a b Harding, Thomas (July 16, 2018). "Arenado, Blackmon, Story lead resurgent Rox: All-Stars responsible for club's surge in NL West standings". MLB.com. Retrieved July 18, 2018. ^ Park, Do-Hyoung (November 9, 2018). "Arenado, Chapman win Platinum Gloves". Major League Baseball. Retrieved November 10, 2018. ^ "Nolan Arenado agrees to eight-year, $260 million contract to stay with Rockies". CBS Sports. ^ Randhawa, Manny (November 14, 2016). "Lucroy to catch for Team USA in World Baseball Classic". MLB.com. Retrieved August 12, 2017. ^ Goold, Derrick (March 24, 2017). "Molina sends message by celebrating in Puerto Rico before return to Cards". St. Louis Post-Dispatch. Retrieved March 24, 2017. ^ Saunders, Patrick (August 9, 2017). "Rockies Mailbag: Does Nolan Arenado have a realistic shot at NL MVP this year?". Denver Post. Retrieved August 12, 2017. ^ Saunders, Patrick (November 16, 2015). "Nolan Arenado drops agent Scott Boras; what's it mean for Rockies?". The Denver Post. Retrieved February 9, 2016. ^ Padilla, Doug (August 19, 2016). "Stop asking Nolan Arenado about Manny Machado and Kris Bryant". ESPN.com. Retrieved September 17, 2016. ^ Starkland, Daniel (September 28, 2016). "Vin Scully signed Nolan Arenado's 40th-home run bat". Dodger Blue. Retrieved September 29, 2016. Wikimedia Commons has media related to Nolan Arenado. This page was last edited on 23 April 2019, at 08:47 (UTC).